In the midst of redoing my room, all I'm digging is photographs of beaches and pools, and vintage flags. Not to mention some killer mirrors. One King Lane's is the bomb.com if you weren't aware. For someone who loves a handful of vintage (and new) mirrors, OKL is my site of choice. Along with a great mirror, great artwork also comes in handy, if I don't say so myself. Gray Malin and Slim Aarons? Double check. American flag? Why not add another one to the collection. White animal head? I mean, c'mon. I can't wait to see how you redo your room! It's so fun to redo a space and add in new pieces. That animal head is so perfect! One King's Lane has been one of my go-to's for years, such a great company! 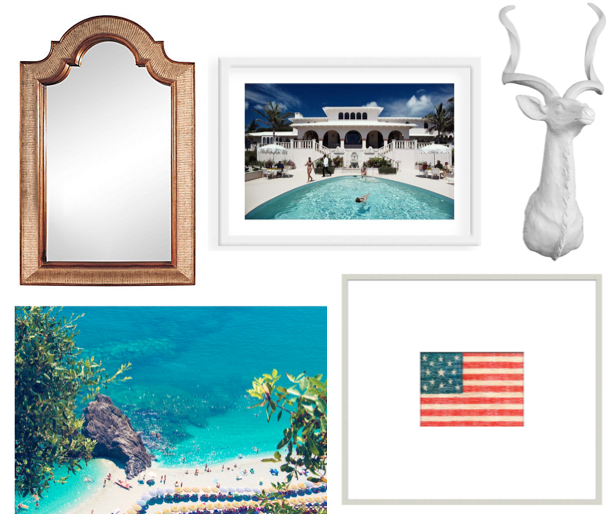 I love these items your thinking about, Slim Aarons and Gray Malin..nothing better! Such wonderful photographs.